22 year old Florida native Gyomara Phillips had the desire and passion to be a stage performer from her earliest memories as a child. As a fan of latin recording artist Selena, Gyomara would recruit her family to pose as her captive audience in her home living room while she sang along and danced to the artist’s greatest hits. For young Ms. Phillips, the arts always served as an escape from reality. Whenever she was sad, angry, or hurting in some way, she knew that she could always count on a film or a song to take all of the pain away. And it was that precise performing arts tonic that she decided to become a part of so that she too could provide the escape of entertainment for people. Throughout the years, Gyomara and her mother moved around a lot, and she was therefore always the “new girl” at school and at social functions. Because of this, she was too shy to join any clubs or groups, and ended up spending a lot of time by herself. When she graduated from High School, she moved to northern Florida for her first year of college, but quickly realized that she was unsatisfied with her life. Feeling spiritually and creatively unfulfilled, she knew that something was missing: It was the alluring call of the stage and the lights… the cameras and the studios… the power of the Dramatic Arts! Ever supportive, the aspiring actress’ mother suggested that they go to Los Angeles to check out the area and some local schools. But while Gyomara found LA to be a beautiful city, her heart was simply not set on living there. It was then that mother suggested that they come to live in New York City. Virtually overnight, they packed their belongings and settled East. Never having acted in front of anyone before, young Ms. Phillips found herself very nervous and anxious when she auditioned for the prestigious American Musical and Dramatic Academy. Not expecting to be admitted, she instead hoped for merely a great learning experience, and the audition process left the shy young lady quite proud of herself... regardless of the outcome. To Gyomara, the eventual thrilling call informing her of her acceptance into the Academy felt like a confirmation that everything made sense, and that this new path as a dramatic performer was meant to be! She considers the two years of her attendance at AMDA to be the best of her life thus far, and she has never felt more at home. Since graduating, Ms. Phillips has already booked some impressive acting / performing assignments, including background work in an episode of Law & Order: SVU and the amazing honor of walking the runway for a hair show during the Mercedes Benz Fashion Week! 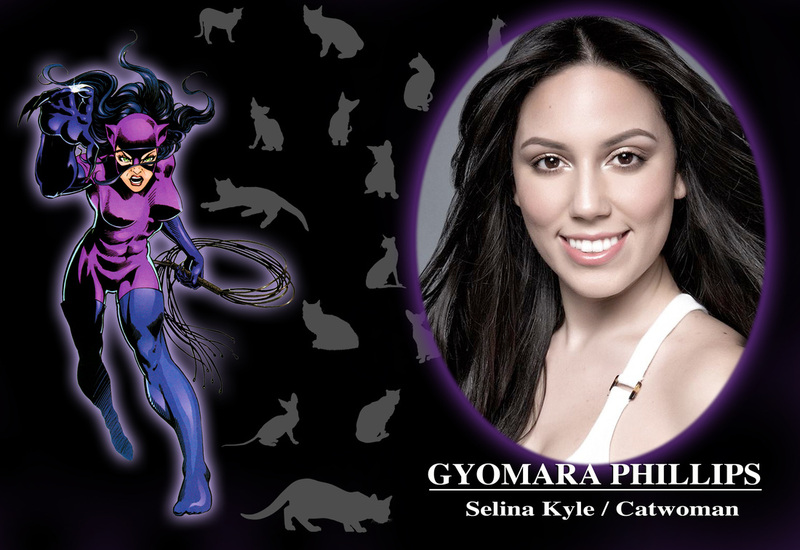 As a late cast addition to the upcoming all-student stage play “FATHERS OF THE DARK KNIGHT”, Gyomara couldn’t be more thrilled to be working again, especially on (as she describes it) “… a play that has so much passion and love behind it…” She considers the opportunity to play such an iconic role as CATWOMAN to be a dream come true! Ms. Phillips hopes to continue learning and growing as an actress, and wishes to continue to be featured on television, and eventually even on film. Her simple sentiment says it all when she states, “I just want to make art”.